Bear, the narcoleptic dog who stole the heart of a Stanford specialist in the disease, has died. 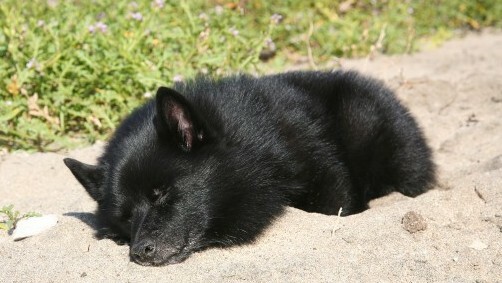 Affectionately called "Bearichon," the Belgian schipperke was the last member of a storied pack of narcoleptic dogs, assembled by William Dement at the Stanford University Center for Sleep Sciences and Medicine in the 1970’s. The pack ultimately helped researchers find the gene responsible for narcolepsy, a disease characterized by excessive daytime sleepiness, cataplexy (sudden sleep episodes after experiencing intense emotions) and REM sleep abnormalities. Based on work done with the dogs, Stanford researchers, led by Emmanuel Mignot, a French pharmacologist and director of the Stanford Center for Sleep Sciences and Medicine, learned that the disease can be triggered in genetically predisposed individuals by exposure to the influenza virus. Bear spent the second half of his life as the family pet of Mignot and his wife Servane Briand. 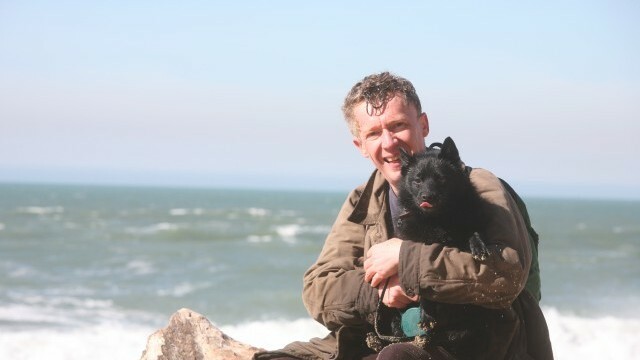 Reached at his office in Palo Alto, Mignot told KQED Science that Bearichon’s death marks the end of an era for sleep research, and a sad transition for his own family. Even an unusually sleepy dog like Bear, Mignot says, can leave the house feeling all too quiet. How did Bear come to you? He was one year old. It was towards the end [of the study], so Bear was more of a mascot for the facility. Then I just had to convince my wife to adopt him. What was it like living with a narcoleptic dog? When Bear got excited, he’d collapse and become paralyzed. So, for example, when he was eating he would collapse because he’d get excited about his meal. Sometimes we’d try to stimulate him by massaging his back a bit so he didn’t fall into his dish. You could feel when an attack was coming. He’d be more wobbly. This was my dog, I could read his mind. At one point he developed a cough that we didn’t understand. I realized that maybe he was almost choking because he had so little time to eat before collapsing into sleep. He was just swallowing this dry stuff without even chewing it. Do you think he knew that he was about to fall asleep, so he was rushing to finish his meal? Once we got him food that was cooked, like rice and a little bit of fish, he was eating better than I was. With soft food, even if you swallow it without chewing it, it’s not a big deal. That solved the problem completely. It was pretty much the only health problem he had. Countless visitors came to see Bear. We’d do a little demonstration and he would collapse. You wouldn’t know if he was looking at you with loving eyes or falling asleep. It was very cute. He had his own personality. He was playful and just the nicest. He loved to be scratched, possibly because he’d been raised in a lab without much interaction. How did you become interested in narcoleptic dogs? I came to Stanford in 1986. I was looking for drugs that could be used to treat narcolepsy in humans. Initially we were interested in dogs because they were the only known model of narcolepsy in animals. Now that we know the genetic basis, you can create a mouse model. We needed to figure out what was causing narcolepsy in the dogs. I thought one way to find a cause of narcolepsy was to breed these dogs that have the genetic mutation that causes narcolepsy. I started this in 1989. Everyone said this was a crazy project to try and isolate this gene, with current technology. It took me 10 years to find it. We found it in 1989. It was the receptor for a chemical called hypocretin. The receptor in the brain that normally responds to this chemical wasn’t functioning. They were going into REM sleep. Are there other narcoleptic animals out there? There are accounts of narcoleptic horses and a bull that has been described. But they’re too impractical to study in labs. Everyone loves dogs. How common is narcolepsy in dogs? It’s very rare. Probably about one dog in a million. But who knows? It could be much more frequent and people just don’t know it. Some dogs, like Bear, might have mild narcolepsy. Bear had hundreds of attacks but in general, they were very brief. Attacks could last a couple of seconds or minutes. I remember dogs that were more seriously affected. There was one who would walk two steps and then fall asleep. Are you looking for another narcoleptic dog to replace Bear? Well, Bear is irreplaceable. But yes, ideally because we have all these teaching events and we love to show the dogs. [Audiences] love it. It’s a good way to communicate what narcolepsy is. If I had another opportunity to have a dog, I would adopt a dog. Our house is very silent without a dog; you always are looking for something, especially when you are alone. The dog is like a person that’s always there, like a shadow. We’ll probably get another one but I think we have to wait a little bit. One of the good things about dogs is that they make you reflect on mortality, that’s for sure.